Background: The so-called Corbyn Review aims to produce a report to the 2018 annual conference in Liverpool. It is not a blue-sky-thinking exercise, however: Submissions invited are limited to answering 32 pre-set questions on six themes with a 250-word-limit on each of the questions. None of these deal with the compliance unit (Disputes) or the fate of expelled and suspended members per se (or, for that matter, with the important demand for mandatory selection). We have therefore picked a relatively open-ended question that we think it worthwhile filling with some of LAW’s demands. 1. 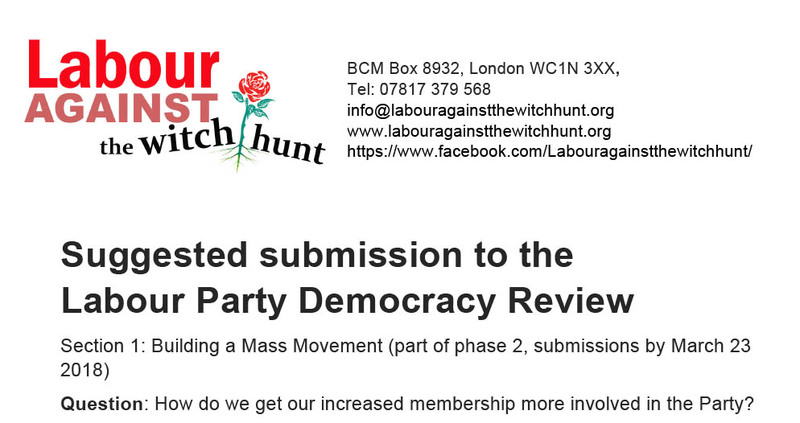 Please submit the proposal as an individual here in the section: ‘How do we get our increased membership more involved in the Party?’ Deadline is March 23. 2. Please submit it to your Labour Party branch and/or CLP and/or other party unit – and submit it again online in their name if they approve it.